When Yuli from MyItThings emailed and asked me to be part of her top secret video project for the Style Coalition, I jumped at the chance to be involved, even when she said it involved being photographed sans makeup. Had I known it involved being photographed without shoes, I may have turned her down. Kidding! In all seriousness, the video focuses on a message I care deeply about. It will be released in the next week or so and I can’t wait to share it with you! In the meantime, here are my before and after photos, proving that it does take a village for me to look good! 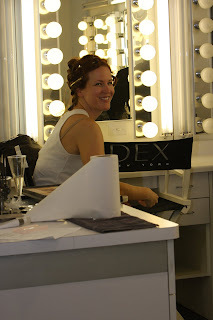 Thanks to the team at DEX New York, including Naomi who did my hair (that’s him, below) and John Henry who did my makeup, and Thomas Cantley for the photos. Here’s my finished look. Proves that hair, makeup and a rockin’ Tory Burch dress will make just about anyone look good! Stay tuned for the video and check out Second City Style for more fashion blogger makeovers.